The BOSS system is not a typical 1-2-3 system, it is a much more flexible concept. This allows you to find the perfect combination of creams & pads to address any paint condition you come across and correct it. Best yet, these pads and creams are color coded. With 4 liquids, 5 pad types (and the Innerflex cushioning pad) in two sizes, you have hundreds of unique polishing combinations. 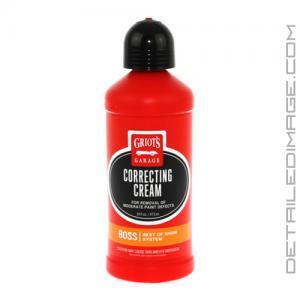 If you are looking for a moderate cutting polish, the Griot's Garage BOSS Correcting Cream is a great choice! Correcting Cream is an excellent middle of the road compound that can cut very well and, with the right pad choice, still finish out LSP-ready on almost all paint types. Like the Griot's BOSS Fast Correcting Cream, this has also become one of our go-to products. If you are in the market for a new medium-cut polish, I would highly recommend Correcting Cream. Featuring sub-micron abrasives, our advanced formula BOSS Correcting Cream effectively eliminates moderate defects, adds depth and clarity, and allows for extended buff cycles that won't dust out, revealing a pristine, wax-ready finish. Directions: SHAKE WELL. Assess the surface, then select the appropriate BOSS pad. Thoroughly butter the full face of the pad. Working a 2' x 2' section at a time, spread product across entire area. Using moderate pressure and slow arm speed work product into surface for 3 to 4 passes. Remove residue with a clean micro fiber cloth. Apply 3 or 4 drops of product to pad for subsequent sections. Frequently clean pad face with pad conditioner brush and/or compressed air via a regulatory approved air nozzle. I love this stuff! When used with a Lake Country orange pad this stuff did wondered on a 9 year old car's finish that had not been well taken care of! Lovely long working time, dust free, EASY removal! I will definitely buy this product again! I used this with an orange pad in a 1 step process to remove swirls and moderate defects from a black Cadillac Escalade with 180k miles and a black Porsche Cayenne with 100k miles. It removed the defects with ease in only three passes and slow arm movement. It is very easy to use, smells great, and dusts very little if at all. Griot's improved their previous creams and the change is big time! Correction cream is a winning product, no dust, long time workable cream!